Once again Mathias came back with new videos for you. Shot of a snowmobile from a snowmobile with only one hand to hold a Sony A7SII ! On this second video, you will see two different things. First part is the “Behind the scene” view from a head mounted non-stabilized GoPro®. The second part if a stabilized sequence from the A7SII recording. We want to show you how the SteadXP datas are recorded. Through a cable plugged from the SteadXp into the audio jack socket, the data are sent to your SD card on one audio channel (left or right) and leave the other one available to record the sound coming from your mic. We use a specific jack divider for that. The actual audio has intentionnaly been left on the right channel. As our team is growing, we’ve also moved to a new office located in the heart of the french Inovallée. New teammates will soon join us in consumer service in the making dedicated to you, backers ! The production process in on track now. We have contractually secured every aspect of the manufacturing process from component suppliers to manufacturers. Things are getting real now ! In the update #6, we entrusted you our concerns about screws and a Chinese supplier who involved some delay on the production process. As backers, we know you expect from us full transparency. Since this update, we first received some components from this supplier that didn’t meet the specifications, which resulted in unexpected delays. Consequently, we reluctantly have to reschedule our first shipment to the end of june. On the bright side, we actually have in our hands the rights components meeting our QC standards. From now on, as a relief we consider this matter definitely sorted out and hope you understand we still have few bumps on the road we can’t always avoid. No matter how small they are, screws are an important part for assembling our products and make sure your SteadXP will hold in any situation you can encounter while filming. Lately, we were expecting some sample screws. They actually didn’t meet to our specifications but good news, this Monday we finally received samples meeting our expectations. We also received the light guides. They allow the light coming from a LED to be oriented in a different direction. We actually use this as a status Led to have visual information on its state. You can easily check if you have properly switched your SteadXP on and if it works properly. Thanks to your contributions we have finally come to a choice concerning the box. 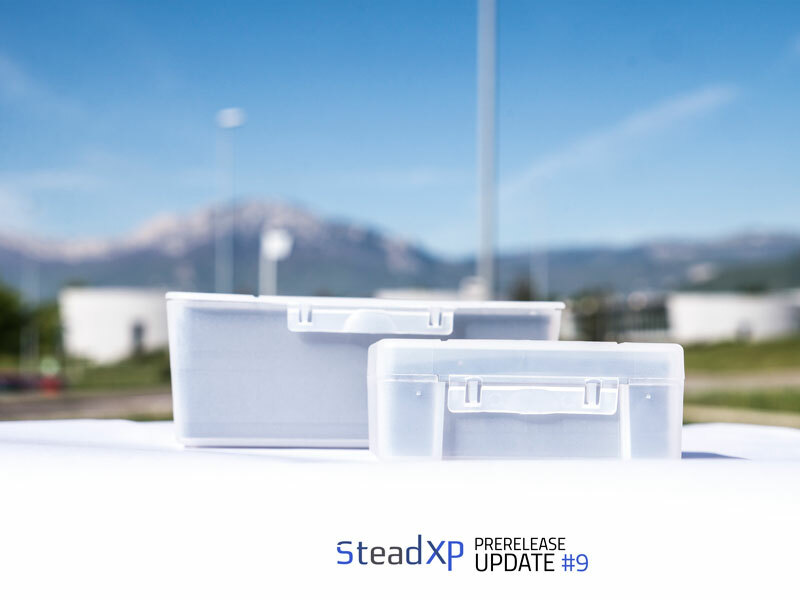 As we don’t want you to receive your SteadXP in a cardboard box, we have been able to get our hands on several options for the packaging of our products and let you choose the one that you think was best for you. You decided to go for the impact resistant plastic box with durable anti-static protective foam. We are currently receiving samples from different manufacturer and will soon show you the one you will receive. One of the main step to export our products in your countries is to meet the requirements of each national regulation board. Certification is the key to achieve this and in the early process, we found the support of a specialized laboratory to help us get through this process. Long story short, this was not a match in our requirements and pretty much a waste of time for us. But don’t worry, we found the right partner now and the certification for our product line is right at the corner as we are expecting the Regulatory study soon. In a constant changing legal environment, Regulatory study Customs was a tricky part to suit our needs. Whether you ship a product in the European union or in the country of kangaroos, each government applies its own set of rules. To ensure our products to actually go through the border and meet their owners, an upstream work has been done on this point even if some minor adjustment are still to be made. We have received a lot of questions concerning the material compatibility for the SteadXP@. This product has been developed to work with a GoPro®, and GoPro® ONLY. If you want to use a SteadXP video stabilizer on a different type of camera, SteadXP+ is your friend. Make sure you have subscribed to the offer that meets your material and your needs. For those who didn’t get the right offer, as soon as the new website is online, you’ll be able to switch to the offer you need. To those of you that have backed the “SteadXP+ early bird” version but finally switched to the SteadXP HDMI reward, unwanted additional fees were calculated. We have reached Kickstarter to obtain a detailed list of backers concerned but they were unable to provide us such a document. For this matter, we will get back to you as soon as we get the right information to give to each one of you an individual solution. We will keep you posted. Thanks again for your support !